In a large mixing bowl, combine flour, baking powder, baking soda, and salt. Using your fingertips, rub butter and shortening into dry ingredients until mixture looks like crumbs. Make a well in the center and pour in the chilled buttermilk and vanilla. Stir just until the dough comes together. Turn dough onto floured surface, dust top with flour, and gently fold dough over on itself 5 or 6 times. Press into a 1-inch thick round. Cut out biscuits with a 2-inch cutter. 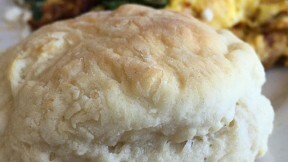 Place biscuits on baking sheet so that they just touch. Reform scrap dough but do not over work the dough.